WE HAVE RENEWED OUR PETITION DRIVE! Please sign our online Petition at the bottom of this page. 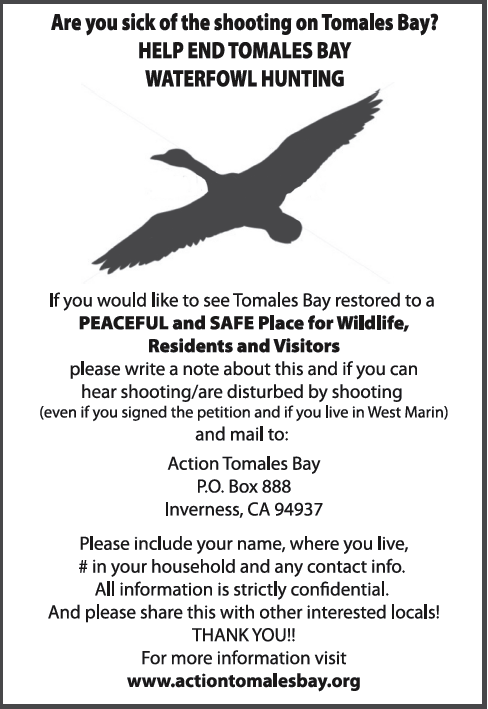 We have resumed collecting signatures to end waterfowl hunting in the Tomales Bay Ecological Reserve. THANK YOU from all of us and especially from the ducks and geese! It is clear that the purposes of the Giacomini Wetlands and Fish & Wildlife's Tomales Bay Ecological Reserve (TBER) hunting zone at the gateway to the Wetlands are completely incompatible, and negatively impact migrating birds, non-target species, residents and tourists. 1. Prior to 2008, there was very little waterfowl hunting in the TBER as the wetlands were dairy pasture, and not many migrating birds came through here. The Giacomini's occasionally hosted hunters in their duck blinds, but hunting was essentially a 'non-issue'. 2. An unintended consequence of the creation of the Giacomini Wetlands, since 2008, has been the ever-increasing number of hunters coming here to the Tomales Bay Ecological Reserve (TBER) -- immediately adjacent to the Giacomini Wetlands -- to shoot the increasing influx of migrating birds traveling through the TBER to reach the restored Wetlands. 3. Hunting season begins again this October 22, 2017 and lasts for 100 consecutive days until January 29, 2018. Hunters may shoot from dawn to dusk - at the flyway entrance to the Wetlands -the migrating birds trying to access this refuge. Hunters are alerted by Fish and Wildlife and hunting groups that due to the Giacomini Wetlands restoration hunting is excellent ‘next door’ in the TBER. 4. For the last several years, CA Fish and Wildlife has increased the daily 'bag' limit, increasing the number of birds allowed to be killed. Incredibly, each hunter, each and every day for 100 days is permitted to kill 37 birds in the reserve--- that's right--- 7 ducks and 30 geese can legally be killed in the Tomales Bay reserve by each hunter every day of the hunting 'season'. 5. Hunters lie in wait and shoot in the exact spot very popular for hiking, kayaking, bird-watching and horseback riding– bordered by heavily traveled roads (including CA Highway 1) and a permanent residential community very negatively impacted by the shooting. Hunting has a pronounced negative impact on a substantial number of residents and tourists. 6. Jules Evens, PRNS Wildlife Biologist who spoke about hunting next to the Giacomini Wetlands on KQED Forum in October 2012, noted "The [Giacomini] Wetlands was established essentially to attract waterfowl and increase the diversity of waterbirds in Tomales Bay. The waterfowl population has doubled every year [since its opening] to a high last winter of about 12,000. The TBER at its northern boundary is an ecological trap as the birds are attracted into the Giacomini Wetlands." 7. Mike Sutton, President of the California Fish and Game Commission, said: "The restored Giacomini Wetlands provides a wonderful improved hunting opportunity". A member of the Point Reyes National Seashore said: "We didn't spend 10 years and over $10 million dollars to make it easy for hunters to shoot the birds we are attracting as they try to reach the Giacomini Wetlands." 8. One undivided wetland, the TBER and the Giacomini Wetlands, is one of the six most biologically diverse areas in the U.S. and supports 13 endangered and threatened species including endangered Clapper Rails and threatened Black Rails, bald eagles, ospreys, peregrine falcons, merlins and river otters— all are affected by the 100 days hunting ‘season’. 9. These Marin wetlands used to be hunting areas: Bolinas Marsh, Muir Beach, Tiburon, Richardson Bay, Sausalito and the Fish & Wildlife Corte Madera Ecological Reserve, but now are wildlife refuges adjacent to thriving residential communities and tourist destinations. Can you imagine 100 days of hunters blasting away in Bolinas? Tiburon? Sausalito? Tomales Bay is a major tourist destination, ecological sanctuary and residential community... why is hunting still allowed here? 10. Approaching the 9th anniversary of the Giacomini Wetlands restoration, it is time to address the unintended consequence of hunters killing migrating birds trying to reach their sanctuary and disturbing and endangering the ecosystem, residents and tourists. Our mission is to stop waterfowl hunting in the Tomales Bay Ecological Reserve, currently administered by the California Department of Fish and Wildlife. Waterfowl hunting in this reserve kills migrating ducks and geese accessing the adjoining sanctuary: the Giacomini Wetlands in Point Reyes Station, negatively impacts wildlife in the area, creates an unacceptable noise disturbance for our bayside communities, and puts recreational users of the bay at risk. The waterfowl hunting season in the Tomales Bay Ecological Reserve (TBER) will begin in October 2017 and continue for 100 consecutive days until the end of January 2018. Shooting is allowed to begin 30 minutes before sunrise until 30 minutes after sunset. CA Fish and Wildlife the past few 'seasons' almost doubled the daily bag limit and increased the number of birds hunters can kill. Each licensed hunter each day (Oct. 22, 2017 to Jan. 29, 2018) is allowed to kill 37 birds in the reserve: 7 ducks and 30 geese! The Tomales Bay Ecological Reserve (TBER) is immediately adjacent to the restored Giacomini Wetlands Sanctuary. (See: http://www.wildlife.ca.gov/Hunting/Waterfowl for regulations and our Map page). Many hundreds of homes are in this immediate vicinity. The Point Reyes area receives over 2 million visitors annually. The hunting area is very popular and used by hikers, bird watchers, kayakers and artists. According to the U.S. Fish and Wildlife Service, less than 1% of California residents hunt, and that percentage is likely even smaller in Marin County. Below is a photo taken at Millerton Point on Tomales Bay in the 70's of 18 shot birds (including illegally poached species) taken by Donna Sheehan of Marshall. The reason we include this photo is to show the 'bag limit' beyond mere numbers on a page. This photo illustrates yet another reason to not allow hunting: poaching birds would be that much harder if no shooting were allowed at all. We , the undersigned, are concerned citizens who urge our leaders to act now to END HUNTING in the TOMALES BAY ECOLOGICAL RESERVE. Please fill out all the boxes in order for this to go through. When complete, just click "Submit" at the end. Thank you very much! Do you think waterfowl hunting is an inappropriate use of the Tomales Bay Ecological Reserve land and waterway? Do you have any concerns regarding residents and visitors (i.e. safety of kayakers and hikers)? Do you believe waterfowl hunting impacts the people, wildlife and environment here? Are you affected by the shooting noise?